APT Australasia Chapter | News and events in the world of conservation technology in Australia, New Zealand, Asia and the Pacific. Practical Building Conservation is a 1, 2, 6 or 9 day program in the conservation of traditional buildings, structures and fabric, held at the World Heritage inscribed Woolmers & Brickendon Estates in Longford, Tasmania. It offers a unique mix of theory, demonstrations and involvement in practical conservation works, benefiting both the participants and the sites. Participants can attend the 6 day program, which includes structured face‐to‐face workshops on Days 3 and 6 on the subjects of Lime Mortars & Plastering, and Roofing, and extend the program to 9 days, by staying on with the expert facilitators, furthering their physical contribution to the site conservation works. Alternatively, attend one or both of the specialist one day structured workshops. Investigate significant building fabric, structures and sites. Learn how to obtain long term sustainable conservation outcomes in real life situations. Share knowledge and experience with conservation practitioners. Understand environmental impacts, deterioration and how to deal with complex challenges. Participate in hands‐on activities with experienced practitioners. Relax and learn in an outstanding cultural landscape. Download the Longford Academy ‘Practical Building Conservation’ Autumn Program for more information. Download the registration form in Adobe Acrobat (PDF) format or in Word format, complete it, and email it to the organiser. Enquiries by email to Greg Owen. The start of 2019 marked the beginning of a project to add new Australian, European and American documents to the Building Technology Heritage Library (BTHL) supported by the APT Australasia Chapter. These documents come from the collection of Professor Miles Lewis, retired professor of architectural history from the University of Melbourne, and well-known to many of our members here in Australia. Lewis’s passion for vernacular and urban architecture finds tangible form in his personal library of more than 2,500 documents, which includes many early European documents on building technology and construction. He is also an avid collector of architectural trade catalogues, a principal component of the BTHL. Architectural concrete and prefabricated buildings are but two topics that will be enriched by his contribution. 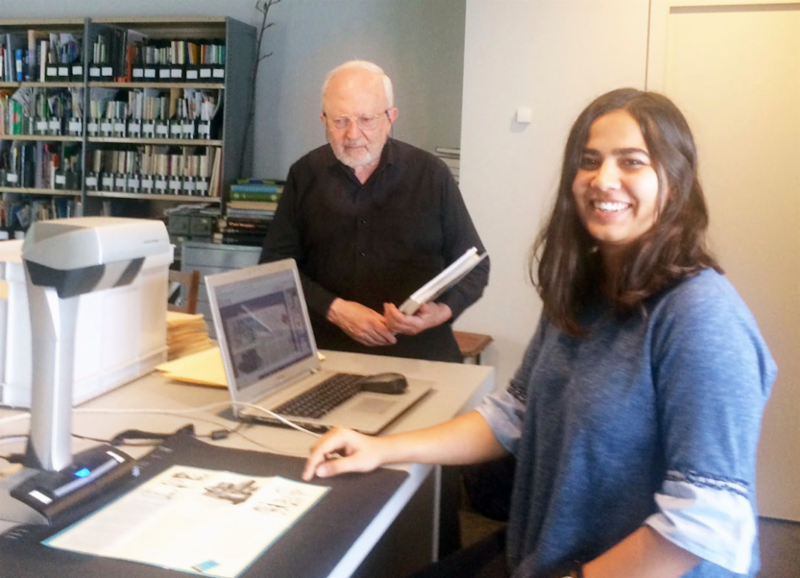 Professor Miles Lewis and scanning technician Meher Bahl at his office in Melbourne, Australia. Professor Miles Lewis and APT Australasia Chapter Convenor Dr Donald Ellsmore were successful in getting a grant from the Vera Moore Foundation to permit the digitisation project, which will be completed by mid-2019. Additional technical support for the digitisation was provided by the University Digitisation Centre at the University of Melbourne. 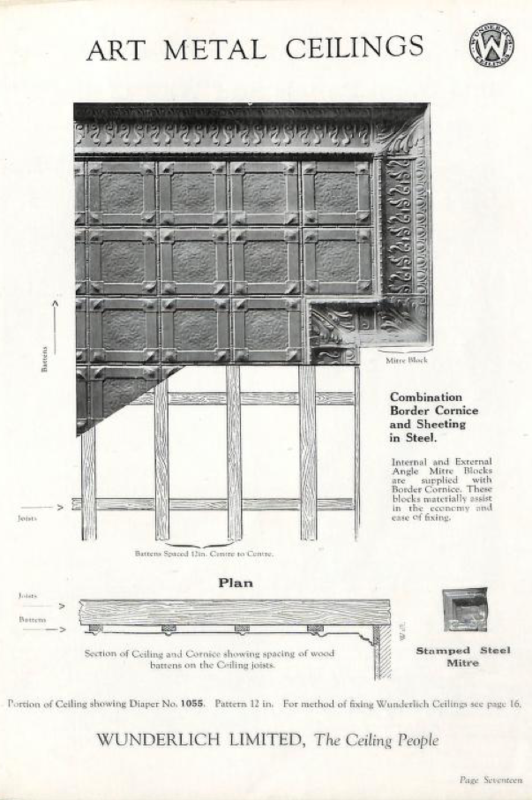 In the course of this project, the BTHL went beyond the 10,000 item mark, as described in this article from Traditional Building. Below are samples of documents from Lewis’s collection now incorporated in the BTHL. Advertisement for Wrought-Iron Hinges, c. 1810. Jas. Thornton & Son, Birmingham, England. 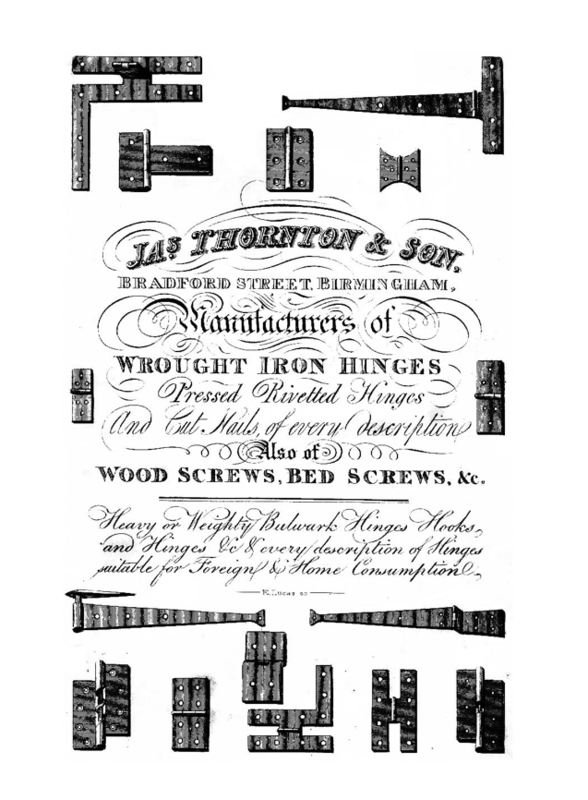 This early nineteenth-century advertisement for wrought-iron hinges is from a company in Birmingham, in the heartland of the English iron and steel industries. 1919. Wunderlich Ltd., Sydney, Australia. The Wunderlich Company was a major building-products manufacturer in Australia. This is one of three catalogues of metal ceilings scanned during the current project. Agco SupaLuvres in Extruded Aluminum with P.V.C. Weatherseals, 1950s. A. F. Agnew & Co. Pty. Ltd., Melbourne, Australia. 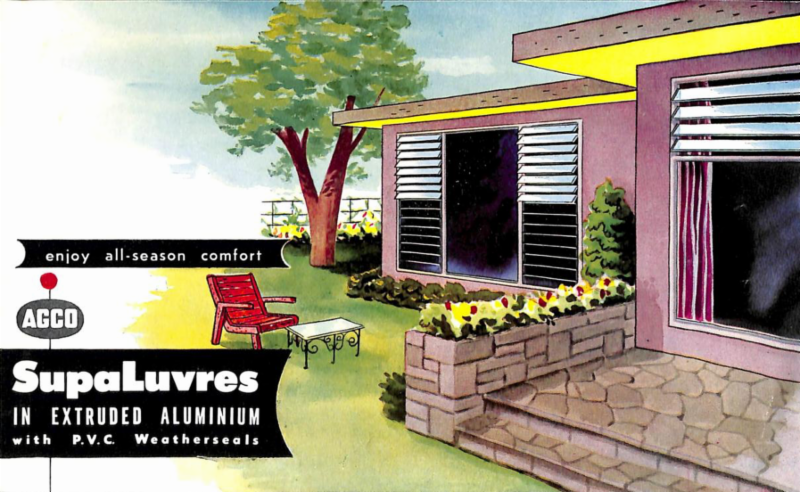 This is one of the newest catalogues from the Lewis Collection, featuring jalousie, or louvred, windows. APT is extremely grateful to Professor Miles Lewis for his contribution to the Building Technology Heritage Library. This year the Longford Academy will celebrate its tenth year. And this brings exciting changes for the future of these hands-on building conservation courses at the World Heritage Sites of Woolmers and Brickendon Estates in Longford, Tasmania. Donald Ellsmore, Convenor of the APT Australasia Chapter, has been the driving force in initiating and coordinating the Longford Academy for a decade, but he now wants to focus on other passions in his life and gently lessen his commitments to LA. So others involved with the Longford Academy, and equally passionate about what can be achieved in the field, met before the Master Classes last August for a 2 day planning exercise to review the past and plan for the future. Arising from that session is the formation of the Longford Academy Board with Greg Owen as Chair and Coordinator of the 2019 courses, and Donald Ellsmore, David Young, Elisha Long, Brian Maxwell, Anthony Mitchell, Marty Passingham, Gary Waller and Ray Wiltshire working together as a Board. The APT Australasia Chapter has agreed to continue to support the Longford Academy, but the Longford Academy Board will now be responsible for organising and running these hands-on building conservation courses. Probably the most exciting thing to come out of the future planning is David Young’s proposal to commence, at Longford in 2020, a Summer School in Building Conservation similar to those he formerly ran at the University of Canberra. Everyone in building conservation in Australia has either been to or aspired to attend that course, and now it will be available again, in an updated format, in World Heritage-listed surroundings. The next edition will be offered from 9-15 February 2020. Watch out for more information about this. The Autumn ‘Practical Building Conservation’ course will run again in May 2019, and flyers will be out about that soon, with the Spring ‘Specialist Masterclasses’ now planned for the first week in September 2019. APT Australasia Chapter has created this page containing more detail on the courses now on offer at Longford Academy, and how to choose which is best for you. Keep an eye out for future flyers and newsletters, but if you have any questions in the meantime contact Greg Owen on (03) 5728 6694 or by email. 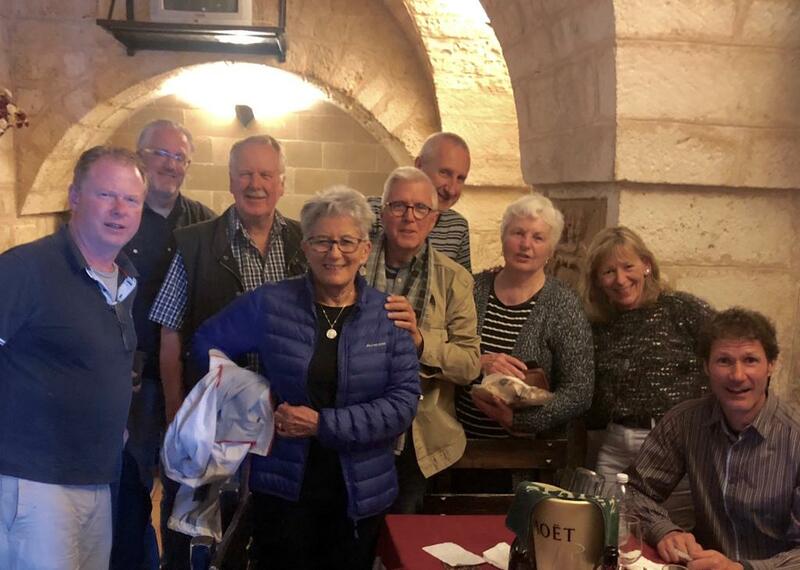 In late October 2018, a group of Australian and New Zealand members met in Ostuni, Puglia, to immerse in the traditional building culture of lime and limestone that are quintessential features of cultural places in southern Italy. 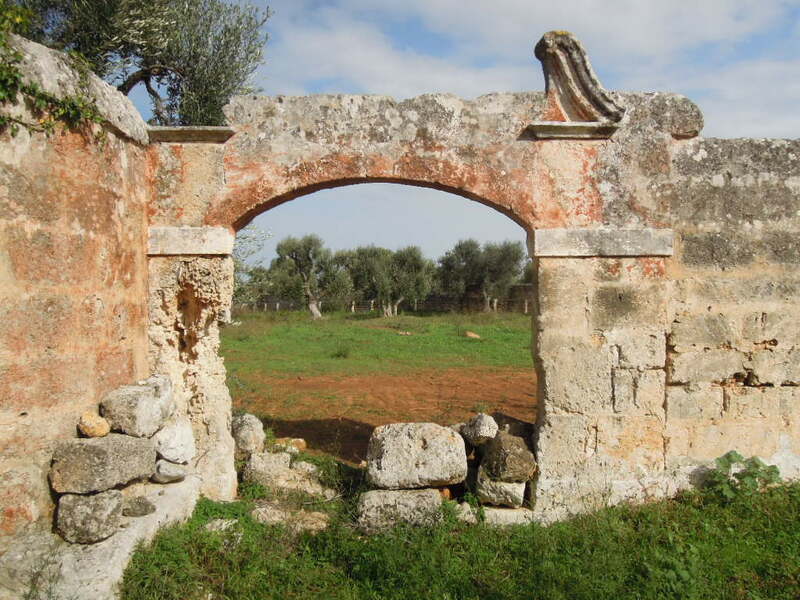 The area is dominated by vast expanses of ancient olive groves punctuated with white limestone hill towns, masserie (fortified farm houses) and trulli (conical-roofed structures). Lime and limestone were the theme of the week-long immersion program, which was facilitated by Peter Lewis (paint manufacturer and owner of the masseria ‘Mangiamuso’ near Ostuni), his architect Aldo Flore (Ostuni-based architectural conservation specialist), other specialists, property owners and lime manufacturers. 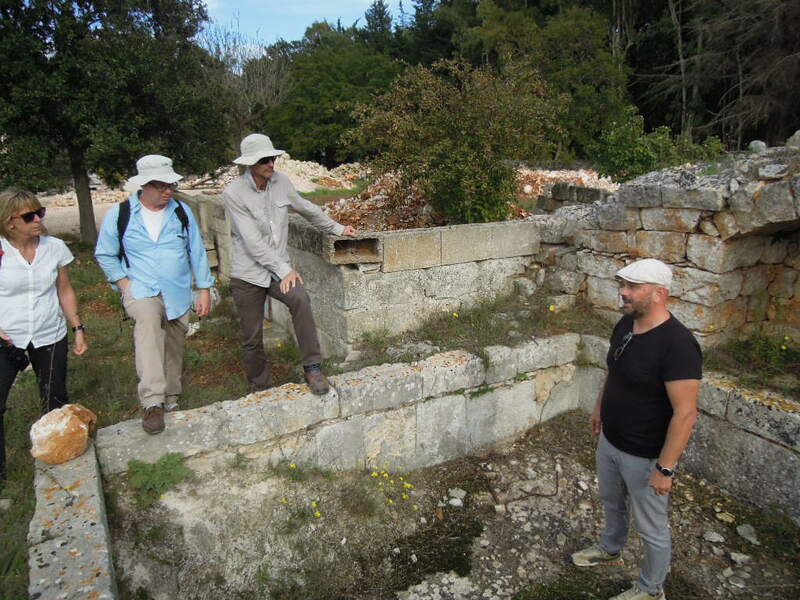 On day one, the group was introduced to the main site of the study program, Mangiamuso, which was nearing completion of works to adapt it for occupation by the Lewis family. 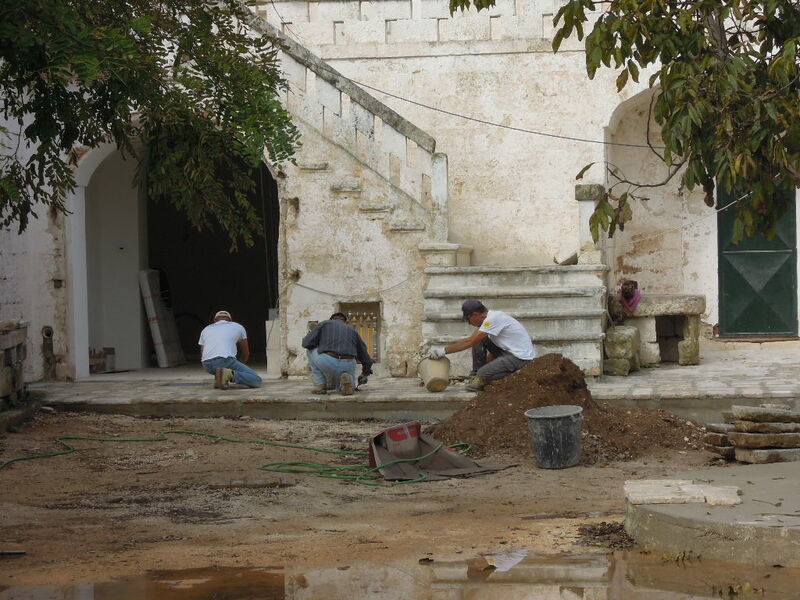 The sensitive conservation program, designed by Aldo Flore, has converted the place into a very tasteful and comfortable home, without diminishing the historic character of the 300-year-old masseria or substantial parts of the property, including two below-ground frantoii (olive mills), which remain untouched by the makeover. On day two, Paolo Albergoni, co-owner of the impressive masseria, ‘Garzia’, gave the group detailed historic information about the history of masserie in Puglia. 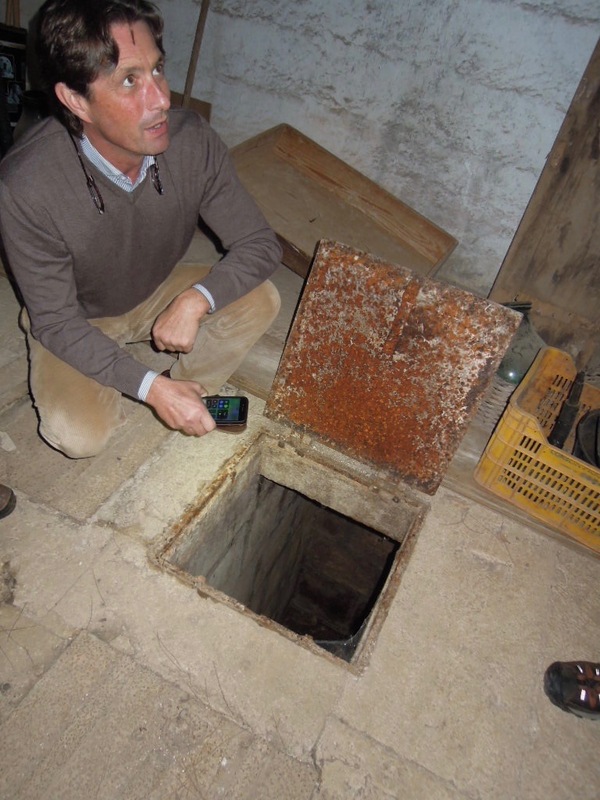 We learnt about the historical circumstances leading to the common practice of locating all the olive oil processes and product below ground for security. Subsequent changes in agricultural practices led to developments of outlying barns, dairies and other structures, and the conversion of many of the below-ground former oil processing and oil storage areas for other uses. Now, hardly any of the masserie continue to function in the traditional manner. Many have been converted for tourism or as residences for wealthy owners. 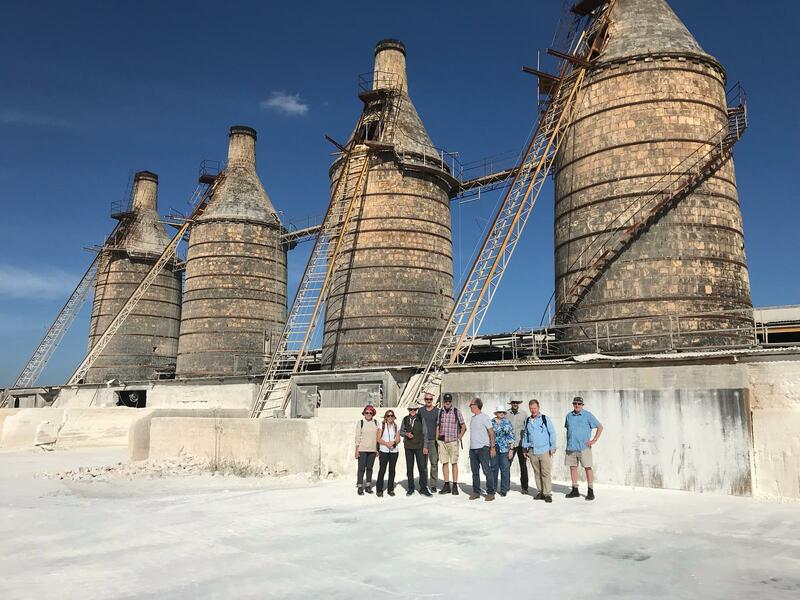 On day three, Aldo Flore led the group to a small lime production plant at Caravigno, where limestone is calcined in a traditional bottle kiln fuelled with wood products including plywood and chipboard, mostly recovered from demolition sites. 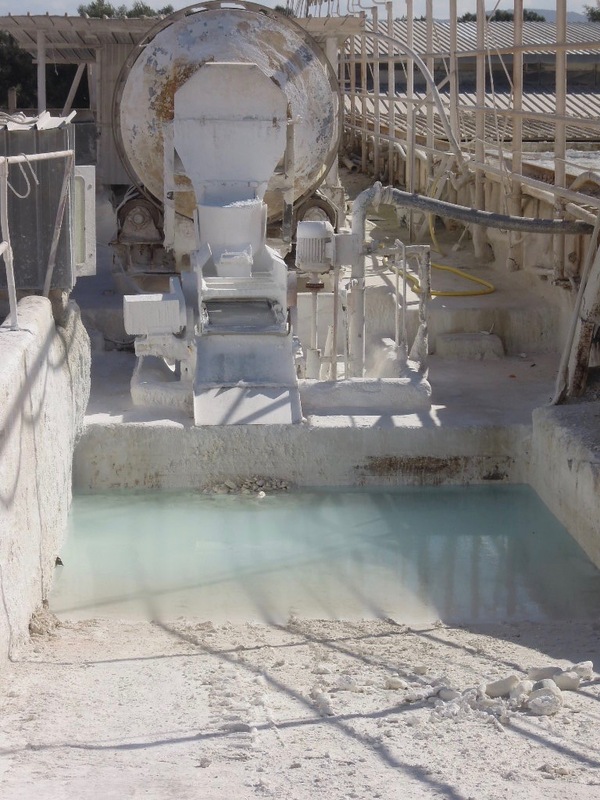 The freshly burnt quicklime is fed into a rotary drum slaking tank from which putty is dumped into large settling tanks, where it remains until it is milled and bagged for sale in a range of putties and mortars for masonry and plaster works. From Caravigno, we travelled to a more extensive lime production plant at Fasano, where waste wood from wood-working processes at the site is the source of fuel for four bottle kilns. 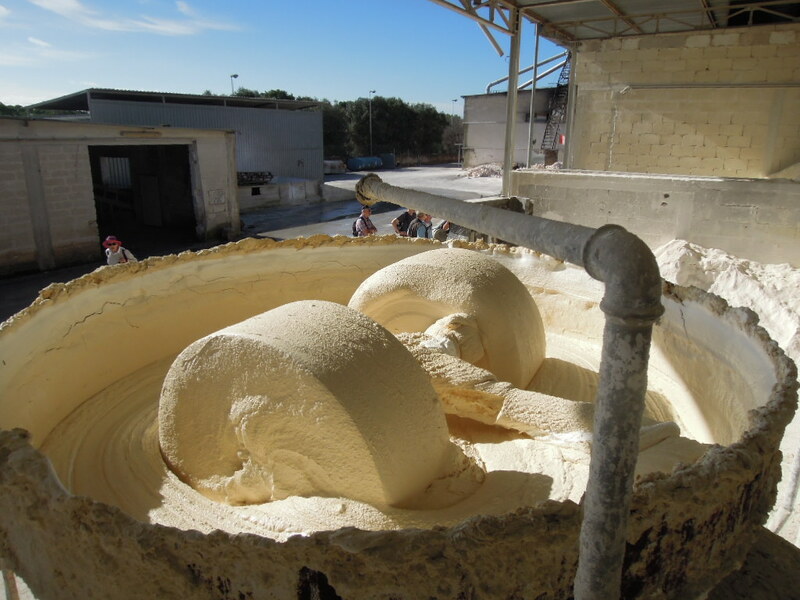 The processes are the same as at Caravigno, though on a larger scale and with further post-production of specialist products including lime paints and decorative finishing material such as cocciopesto (lime with fine-ground terra cotta). 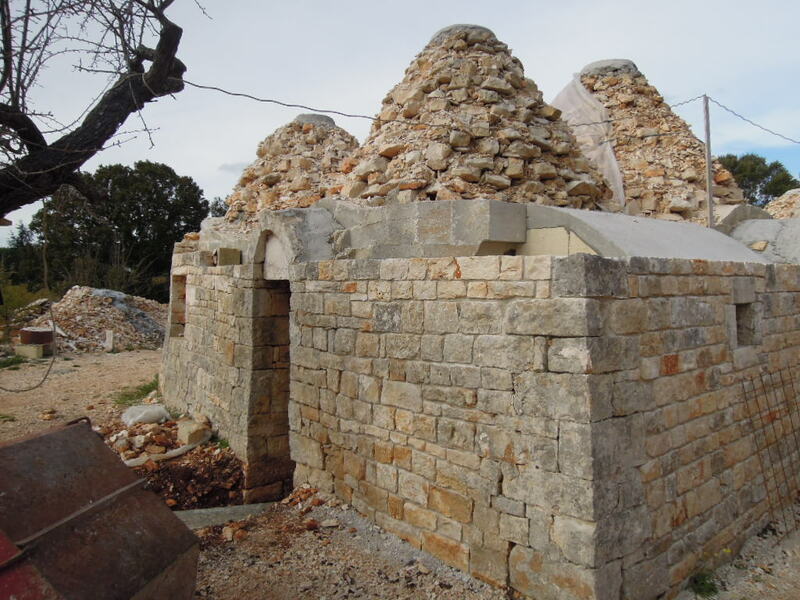 After visiting the lime works at Caravigno and Fasano, we inspected a trulli conservation project with Aldo Flore near Locorotondo. Here it was enlightening to obtain first-hand details of how the traditional cone-shaped structures – which were entirely basic and primitive at the time of their construction – are being adapted to address the architectural challenges of climatic control, damp management and seismic stabilisation. 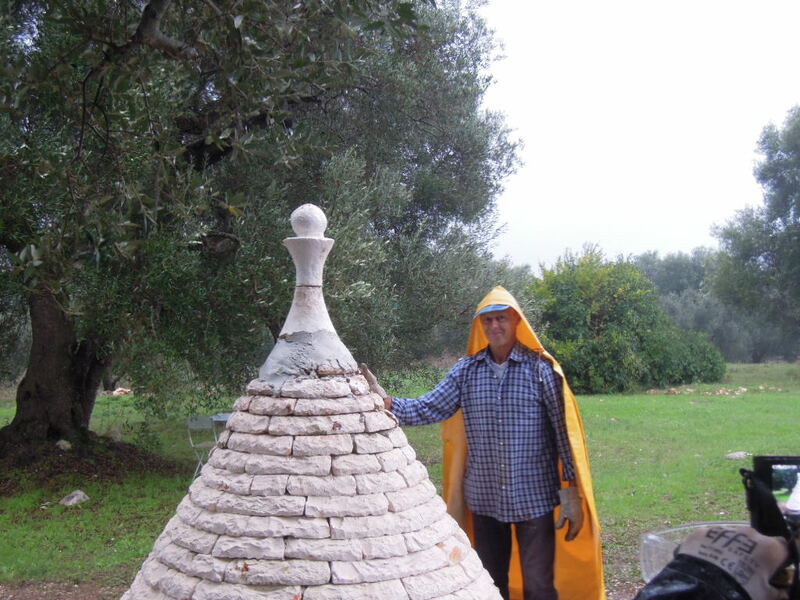 Aldo has managed many similar issues in Puglia and has emerged with specialised knowledge of the building type and adaptation and re-use. The renowned food and wine of Puglia featured in the group’s next stop where a superb late lunch was served by chef Stefano and his infamously grumpy cameriere at Osteria del Cocopazza (pazza means crazy in Italian) in the centro storico of the hill town of Martina Franca. Time was limited for an extensive walking tour of the historic centre but good memories of the gorgeous historic city will re-surface again when memories of the lunch eventually settle! On day four, the group got seriously into trulli and more food at Casa Cilona, near Ceglie Messapica with Puglia-based American architect Amanda Roelle, who provides educational programs on trulli, and host/chef Tonino. 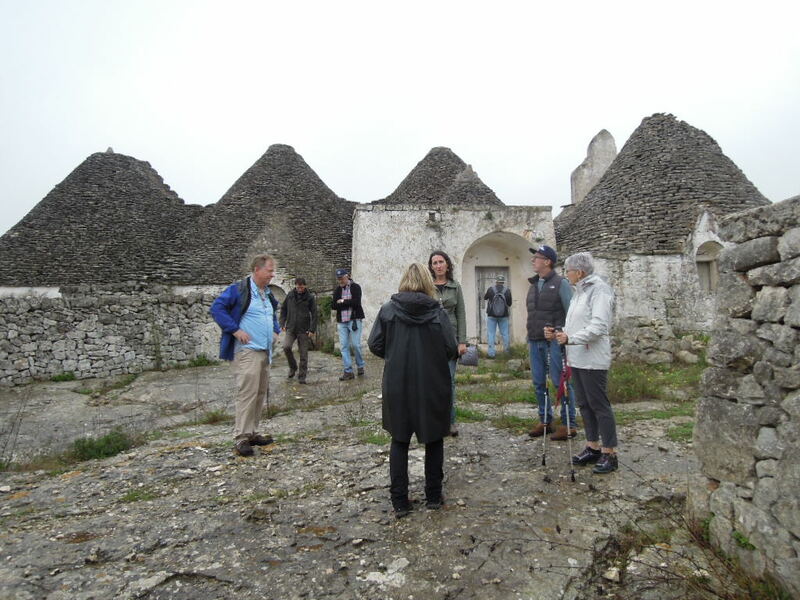 Amanda led the group on a walking tour of a collection of abandoned, though largely intact, trulli in a gorgeous bucolic landscape at Pascarosa. 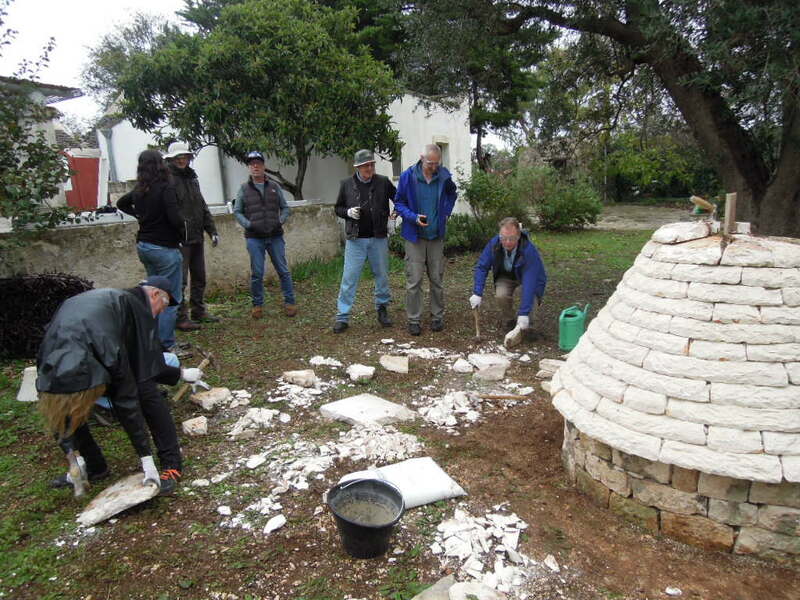 After pranzo (lunch) it was down to work with Mario the trullaro (trulli builder), shaping and laying chianche (stone shingles) to construct a cono (conical roof). At the end of the day Amanda made a more formal illustrated presentation on the typology and construction details, followed by a memorable meal. On day five, the group travelled to Matera the remarkable historic city of ‘Sassi’ (ancient quarters) built into a rugged gorge, in the adjoining province of Basilicata. Sadly the place was densely packed with visitors on the day, a public holiday, and it became difficult and uncomfortable to navigate around the site. Our guide, Dora, provided a very informative tour of the ancient city, explaining the history, decline, shame, recovery, gentrification and tourism appeal. However, the crowding and lack of easy access to important features compromised the experience. A year ago the experience was different: the place was tranquil. Since then, efforts to promote the World Heritage listed place, including selecting it as European Cultural City of 2019, have tipped the balance towards tourism exploitation. Even so, Matera was and is a special place to visit. On day six, we travelled to Alberobello, also World Heritage listed, containing a high concentration of trulli. The experience was slightly more relaxed than Matera and highly rewarding, but Alberobello also is labouring under the weight of visitors and there were lots of them on that holiday weekend. The nearby gorgeous small hill town of Locorotondo, featuring a concentration of commerse (barrel vaulted limestone terraces with chianche roof coverings) was also bulging at the seams due to the holiday visitors. Our visit there was truncated by the complications of holiday traffic. 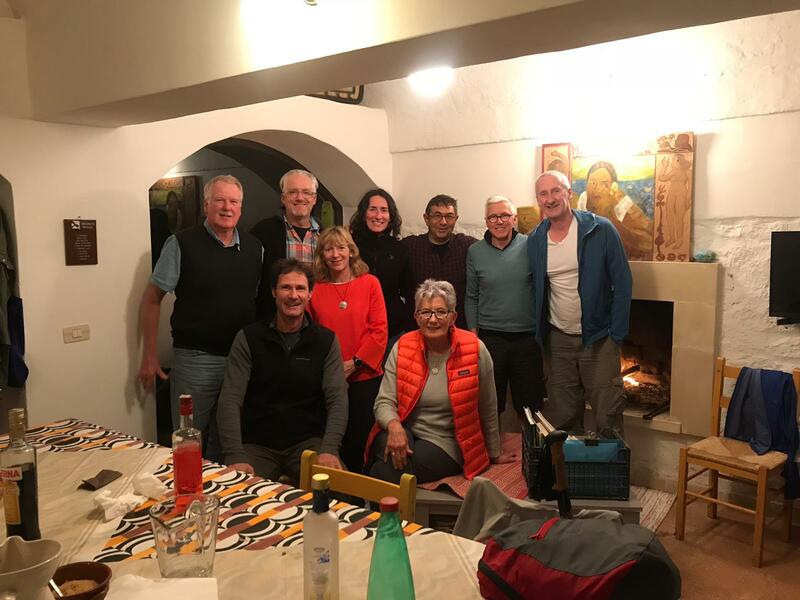 At the end of the week, the group dispersed to other parts of Italy (Lecce, Naples, Rome and Sicily) to continue their Italian experiences, or on to other destinations (USA, Germany and Thailand) and home (Australia and New Zealand). The Longford Academy Masterclasses are collaborative learning activities led by experienced APT specialist practitioner educators. Participants work on conservation tasks under direction and engage in practical and theoretical activities, which may include information sessions, discussions, inspections, investigations, recording and group activities. The 2018 Spring Masterclass in Masonry and Lime Mortar Repair Methods is presented at Woolmers and Brickendon Estates, Longford, Tasmania (World Heritage inscribed) by heritage conservation specialists, David Young and the Longford Academy team. David Young is a conservation practitioner, educator and author of technical publications on the conservation of masonry. His recent work includes investigations of lime in mortars and plasters and their application in the repair and conservation of traditional buildings. The 2018 Spring Masterclass in Carpentry and Joinery conservation techniques is presented at Woolmers Estate, Longford, Tasmania by Gary Waller and specialists from Allways Wood Joinery, NSW. Gary Waller is a conservation specialist contractor and joiner; Managing Director of G&C Waller Builders and operator of a heritage joinery shop at Sutherland (AllWays Wood Joinery) employing a specialist team of joiners using traditional belt-driven machinery and modern equipment to reproduce high quality new work conservation of significant heritage building fabric. The 2018 Spring Masterclass in Roofing and Roof Plumbing conservation techniques is presented at Brickendon Estate, Longford, by Greg Owen, a maintenance engineer, licensed plumber, conservation specialist contractor and managing director of Period Building Conservation, Stanley, Victoria. He is an expert in traditional roofing and conservation of traditional structures including iron and galvanized steel roofing. The three Masterclasses run in parallel over 6 consecutive days. The program includes a one-day workshop on Saturday 1 September on Conservation Repair Methods, which is open to additional participants. A participation fee of $800 ($700 APT members) covers materials, site costs, refreshments and lunches. The participation fee includes the one-day conservation workshop on 1 September. B&B accommodation is available on-site at Woolmers Estate (tel: 03 6391 2230), Brickendon Estate (tel: 03 6391 1383) and nearby Racecourse Inn (tel: 03 6391 2352). Telephone direct for APT rates. Repointing sandstone kerb of Woolmers fountain, May 2018, A Mitchell photo. The ninth annual APT Australasia Chapter Longford Academy was held at the World Heritage inscribed Woolmers and Brickendon Estates on 7-12 May 2018. 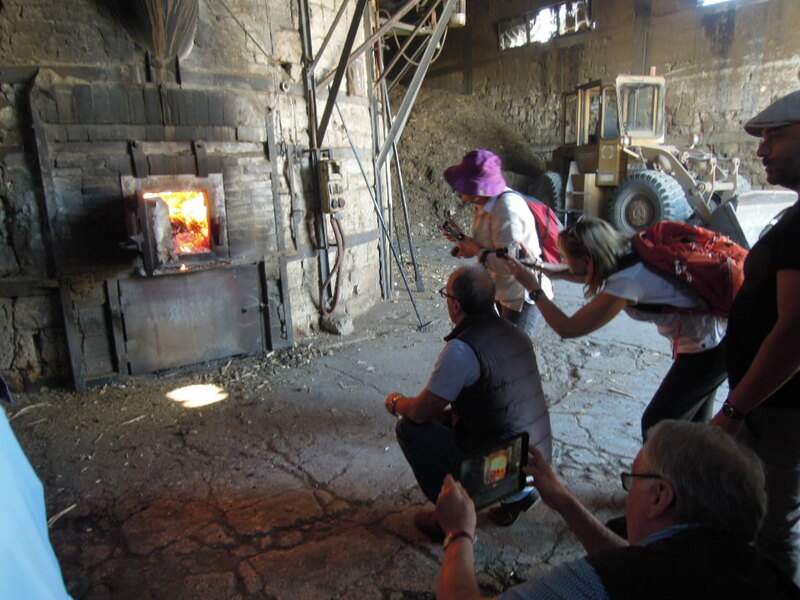 The group of 25 participants included builders, tradespersons, materials conservators, architects, engineers, archaeologists, curators and others actively involved in conservation works and heritage management. The focus of this year’s activities was the c.1840s walled garden area of Woolmers Homestead, including two garden pavilions and the central fountain. At Brickendon the open cart shed was the subject of a structural and conservation analysis. Activities included investigations (smoking pavilion, fountain and Brickendon cart shed) and works (fountain and stone kerb, garden pavilion and Coalbrookdale bench seat). Fabrication of rainwater head at Brickendon, May 2018, A Mitchell photo. Formal one-day workshops on lime mortars and roofing were also built into the six-day program. These were attended by builders from the Tasmanian Independent Builders Association and Port Arthur Historic site. David Young presented a workshop on lime in conservation works and Greg Owens presented a workshop on the conservation of roofing, leading an inspection and discussion of the material construction and significance of the significant early roofs at Brickendon Estate. He also conducted hands-on demonstrations of crafting traditional galvanised steel rainwater goods. Investigation and impact drilling of timber base of Woolmers smokers pavilion, May 2018, A Mitchell photo. This building was found to be in poorer condition than it appears externally, with questions raised about latent structural conditions, including the sub-floor. The building was subjected to a detailed analysis and discussion of appropriate approaches and methodologies to address its repair and conservation. This analysis is informing further investigative work and conservation repair to be undertaken in June. Reconstruction of roof cladding on Woolmers garden pavilion, May 2018, A Mitchell photo. The failed roof cladding was removed from the garden pavilion to expose and treat the roof timbers in preparation for the introduction of new matching roof cladding. The lower part of the structure was found to be very fragile, needing a gentle touch to stabilise the weathered cladding and flooring. Again, detailed analysis and debate by participants over approaches to the repair of this fabric is informing further necessary conservation works. Cleaning of Woolmers cast iron fountain, May 2018, A Mitchell photo. The mid nineteenth-century cast iron fountain was hand cleaned and coated with penetrating oil in preparation for re-coating. Perforations in the bowl and some extreme corrosion were considered to be suitable to be safely re-painted without further intervention. The new paint coating system will replicate the traditional faux bronze paint finish. Paint sampling revealed the bronze green base layers of the originally specified faux bronze finish. The sandstone kerb was re-pointed with a lime and fine sand pointing mix following hand-removal of the old decayed pointing. Coalbrookdale garden bench seat at Woolmers, prior to work, May 2018, A Mitchell photo. The c.1860s bench seat was disassembled and the cast iron partly stripped by means of an alkaline paint removal poultice. Paint sampling revealed evidence of the same faux bronze finish. It will be reconstructed with new pine slats and re-painted in the coming months. The open-sided cart shed at Brickendon was examined by a multi-disciplinary group and a report with recommended actions provided for consideration. There is evidence to suggest that the structure is probably an early estate building but heavily modified to accommodate changing needs uses. It requires substantial works to stabilise the structure. Hot lime slaking at Woolmers, May 2018, A Mitchell photo. In parallel with the works described above groups worked at Woolmers on the preparation of lime repair mortars and at Brickendon examining roofing in preparation for works to be undertaken during the masterclasses at Longford in Spring 2018. Re-pointing end wall of Woolmers wood shed, May 2018, A Mitchell photo.